As we edge closer now to 2014, when everyone will be upping their game with a clean slate of points and new titles to chase. We want to talk a little about how riders can ramp up their performance when coming down the hill. For that, we’re joined by Factory Doublecross A-Pro, Olijuwon Davis. He sees a lot of riders during the year in clinics and as a personal coach. OD, welcome to the show man. Olijuwon Davis: How’s it going, Mike? Thanks for having me, man. BMX News: It’s going great. Thanks for being here, and for taking the time out. 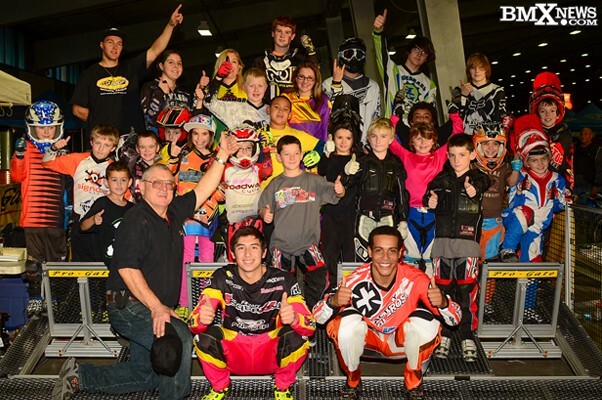 So, you did one of the free Pro Gate clinics at The Grands along with Tyler Whitfield. The morning session was led by German Medina, Marion Pajon, and Greg Hill. So we had a pretty great cast of instructors for the day. Overall, I think we had like 250 riders which I thought was awesome. In talking about ways to improve for 2014, what were some of the top I guess you call it “mistakes” that you saw on riders in the clinic, as well as just on a daily basis? OD: Well, the thing I noticed the most when I’m working with someone is lack of guidance. I think because there is no structured time to practice, on a certain day of the week, with a coach out there watching everything, a lot of times kids are at the track and practicing just poor habits, and that’s just because they aren’t aware of the right mechanics. Right off the bat I’ll assess somebody at the track. I’ll watch them ride and see what they’re doing before I… it’s kind of like a needs assessment. I watch what they’re doing. Then what I do is just try to give them a few “critical elements,” as we call them in teaching. If you think about doing it in this fashion, it works. I’ll watch a rider take off and then kind of pick that apart and give them little adjustment feedback– to think about this and to think about that (“try to do this”)– and it seems to work. Like I said, it is a lack of guidance, so (the rider) needs to make it a “study what you do” kind of thing. Knowing the little cues and being able to give them to the kids, that seems to be the biggest help, and can really bring some amazing results. I used to do the slingshot gate I learned from my friend Jeff Upshaw back in the day. So, for me to learn the random gate I literally had to watch GO211 for hours, studying how the pros (who were using the random gate at the time) would do their gates. So my buddies and I would turn the cadence off when we’d practice random gates, and just watch the light and learn how to snap. So what I learned from all those hours of studying and practice was a huge help—both in my own racing, and in trying to teach it to other riders. It really helps you to teach it to someone else. I mean, I didn’t learn how to do a (random) snap until I was 20 or 21 years old and within two weeks of doing clinics with kids you know 4 or 5 years ago, I was able to teach 8 intermediates how to snap just by using proper critical elements. Long answer, I know…but that’s what I noticed in the Grands clinics. Give the kids some critical elements, and they will respond to the adjustment feedback. News: So, sometimes, I guess like you said, it takes just refinement and tweaking a little bit here and a little bit there; as they call it in NASCAR, some pitch here, some wedge there. Just dial things in and make sure that you stay consistent. In the clinic, at the time I stopped by, I saw riders who were being coached by you guys and then taking a couple of gates and then coming back the next time and improving each time and just in a very small, short amount of time. I imagine it’s the kind of thing that if you just do it once in a while– every week at the track practice or whatever, you tend to slip back into those old habits. Is that a fair assessment? OD: Oh, yes. Completely true. And it’s both physical and mental practice that makes you better. I think with coaching –with myself– if thinking about the gate technique (because I do it) I have think about it mentally and then physically do it. When I’m working with the kids, it’s like a reciprocal process where I’m learning also by telling them how to do it. So not only do I get the physical reps I get the mental reps, and when I teach them, they can go home then with the knowledge of how to do the mental reps. So hopefully they’re getting training physically, and when they’re not on their bike, maybe they’re thinking about the gate, which is also getting physical practice. So, it’s constant refinement, no matter what level you’re at. You know, it’s kind of funny how one day you’ll figure out this little element with the gate and you’re like “Oh, that works good!” and you’ve stepped up on this new rung on the ladder. Then you learn something else and you step up again– and you’re like “How did I get along without this?” So even being a professional racer, I’m still constantly learning everyday so when I learn a new element, I talk to the kids I work with and it’s kind of like “Oh, well now I have this new way of thinking about it.” It’s all the same thing, it’s just applying a thought process and a movement, and it makes it better. News: And once you actually have the right form, and your gate is refined to “pro level,” you’re still not “done.” Even the top guys still do gates all the time because you’ve got to keep that reaction time and those reflexes and those senses sharp, right? OD: Absolutely! Obviously, in BMX, the start is one of the most critical parts, because most of the guys and most of the kids can all ride fast laps if they get out front, but the biggest factor is *if* you can get out front. If you can get out front you can control the lap a lot better, and avoid getting cut off, or stuck behind someone. So you have to work on that force application and all those things that go in to really putting the power down out of the gate. And, like you said, even the top riders are constantly doing it because they know how important it is. If you can get out, once you get to top speed, you can go. It’s ‘Can you get to top speed?’ and that’s obviously why the gate is so important. News: So, even without a personal coach on staff to give you the tweaks and stuff that a rider might need every day, if you had something like the Pro Gate Junior at home, it seems like it’d be so much easier to just set it up and do the training. I think it sets up in five minutes or something like that… Set up a video camera and no excuses, right? OD: Absolutely, and I think the best thing about having a Pro Gate Junior would be… I mean gates, like we said, are the most important part of the race. I also like to think they’re one of the most fun things to do because you get to work on reaction time, work on explosiveness, and work on getting the top speed, and it’s like killing two birds with one stone. If you only do sprints and then you go do gates, that’s double work. Whereas if you have that Pro Gate Junior at your house, you can do gates and sprints all at the same time and, man, that’s great! News: Yeah, no doubt. You don’t have to get in the car and drive 45 minutes to the track just to get those gates—you have it right there as a tool to use any time you want. I mean, you’re already investing in traveling to all these races– to invest a little bit extra in getting the right tools, it seems like a must-do. Let me ask you this: How does the full-on BMX practice gate, like the Pro Gate Junior with lights, cadence and stuff, differ from a Stumpy gate or, what I like to call a “zombie gate,” that is just dead start kind of thing? How do those differ in creating the best training environment? OD: Well, the difference in my mind the difference between the Pro Gate Junior and something like a Stumpy gate is that with the Stumpy gate, you can work on your form and all that stuff. But, in BMX, you have to be in the zone and you have to react to one stimulus (the first beep or the first flash of the light). So with the Pro Gate Junior it’s race simulation—you are getting as close as to race conditions as you can get without going to the track. I do sprints on the block and that is completely different than going out and doing starts because, off the block, you’re kind of like “Alright, here we go” and then you put the power down. Whereas, when you’re in the gate, you got to be crisp, you got to be on, you can’t be 1/100 of a second off or you had a late gate… you got cut off. The Pro Gate Junior is definitely a good investment man. If you can get that at your house and do gates on a daily basis– I mean, imagine how good an individual is at doing gates and getting out if they could go to gate practice at the track X times a week. If you could pull that thing out of the garage and do it consistently, that’d be definitely a worthy investment. News: No doubt, no doubt. Do you have any quick tips you can give listeners for their 2014 gate? OD: The way that I teach the kids (and anybody, for that matter, no matter what age) is simple as possible. The “K.I.S.S” principle; keep it short and simple. The easier it is, the better. What I do is, I just like to think that when I set up, I’m going to have my weight over my front foot because that’s where pedal is, I’m not going to be pushing on my front pedal, but I’m going to be standing on my front foot. The next thing you do is obviously you’re going to hold your bars and you want to roll your wrists a bit because you’re essentially pulling yourself down and forward. So, what I do is keep my weight on my front foot and I grab my bars and I lean back until I feel tension in my arms –meaning that I’ve taken all the slack out of my arms, so my arms are not super tight and locked and stiff, but it’s pretty straight. The reason that I want it to be straight is so that when I do react to that stimulus (whether you act to the beep or the flash of light), I pull my bar, I think to myself to stand on my front foot and pull my handle bars. When I pull my handlebars, my body moves in toward my bike. So it’s every action has an equal and opposite reaction. The harder I can pull my bars from the loaded position, the faster I can move forward to my bike and rush at the gate. So what I think the simplest –keep your weight on your front foot, get back until your arms are straight, and as soon as your hear that first beep or see that first light, I just think “rip the handle bars off.” You want to pull yourself toward the front of your bike to start forward motion — that’s how I like to think about it. That’s a very simple way, and it works. News: Sounds good. How’s 2014 shaping up for you? When are we going to see out at the races next? OD: I got a new sponsor back in October– Factory Doublecross Bikes. Bob Deily is behind me 100%, and I’d like to thank him for everything he’s doing for me. This is my last semester in school and I’m actually not attending class full time anymore, I’m student-teaching now. So, I’ll just an 8-to-3 schedule. That’ll be very nice. I won’t have night classes anymore and stuff like that. Bob’s given me the opportunity to attend as many races as I want off of that schedule, whichever ones I want. I’m still A-Pro and I would like to earn that AA class. Last year, I raced Elite one day a weekend in the UCI events about midsummer on. This next year, I’d like to attend as many UCI events as I can and swim with the big boys. Those guys are phenomenal. If you ride bikes, they’re the pinnacle. I just want to push myself to get to that level and the only way you get there is by swimming in that water. Bob’s given me that opportunity to attend as many UCI events as I want. When I am at the UCI events, when I can race up, I’m going to race Elite both days because that’s the only way to get there. The only way you get comfortable racing there is by racing. From experience, every lap becomes more normal. These guys are so great, you have to practice. I just keep putting in work and staying humble and just trying my best, you know? That’s all I can do. News: Yeah, for sure. So, what’s the first race on your schedule? OD: I’m almost certain that the first race I’m attending is the international in Tulsa which is at the end of January. After that, I think I’ll be going out to either Louisville or Oldsmar, and I plan to go to Oldsmar either way. News: Right on. And while we’re at it, any other shoutouts or anything else to add to the interview today? OD: Well, first off, I would like to thank God for all the safety — just stay faithful and try your best. Anybody’s capable of doing anything. I also want to thank everybody that supports Doublecross Bikes and all of our co-sponsors. Also my friends and all the people that show their love and show you support. And I want to thank all the little guys and little girls for being so hungry to learn something. They come to you bright eyed and they just want to know something and you tell them and you see the “aha” moment in their face and you’re like “Wow! They got it.” They know right now, at the age of ten, what I learned three weeks ago, so that’s awesome. News: Yeah, no doubt, man. Well, you’re definitely one of the good guys and it’s always a pleasure to work with you, and to be a part of what you got going on. It was your first time on the show, so we’re glad that you joined us today. Best of luck in 2014! OD: I really appreciate it, Mike. Thank you for having me, man.